Tears are often world changing for us in good ways. They can convey a depth of emotion which presses irresistibly toward forgiveness, or recovery, or the healing of a relationship. When they are connected to an apology, they convey a heart touching sincerity. When they are part of a vow to do better, it becomes all the more potent, and all the more believable. And, when they are connected to the joy of achievements or life’s milestone events, they help express, and even add to, the depth of the beauty of the occasion. But, there are times when even the most visceral and overflowing tears are completely powerless to alter the harshness of our reality. Often, these tears flow out of an indifference which causes us to wait too long, or a carelessness which causes us go too far, or an arrogance which blinds us to life’s treacheries. And, in all of these cases, we are then left with only the completely powerless tears of too late. Such are the bitter tears which come after lacerating words which can never be taken back. These are those hurtful words which suddenly escape our normal discretion through the portal of an angry moment - only to irrevocably diminish, and even destroy, the bonds of trust and love. And, when these words are finished, all that is left to us is an enlarged "aloneness" and those horribly impotent tears. In my own life, such tears commemorate a sad and unalterable mistake that I made when I was young and too unaware of how life really works. So, in my youthful carelessness, I gave away something of inestimable value to people who valued it very little – at the great expense of those who deeply cherished it. That something was my relational attentions. What I failed to adequately recognize in those days was that life happens in ranks. And, those ranks have a time clock on them. And, those precious people who are ahead of us in the forward ranks, who gave us life, and sacrificed for us, and who love us so very deeply, are soon gone. So, while I was lavishing the attention of my young life on shallow, transient relationships and pursuits, those precious forward ranks were quietly forfeiting their days. But, I failed to notice that relentless march of time and its very serious consequences until it was too late. And then, suddenly, they were all gone. Those treasured, wise, trust-worthy, always-there-for-me people were not there anymore. And, only then did I realized that I had traded the irreplaceable for the mostly irrelevant. And, this unalterable reality has become, for me, one of those which is completely impervious to my regret. Thus, even now, these many years later, the bitterness of that mistake still stings and stains my heart in my reflective moments. And, that sorrow remains a hard reminder of those additional wonderful breakfasts in my grandmother’s sun drenched kitchen which could have been. It reminds me of the days that were available for fishing with my Dad which I ignored. It reminds me of the missed holiday gatherings when I could have listened one more time to their sage conversations and felt their overflowing love in my life. But, I squandered those final opportunities on the much less important. And now, no amount of remorse can restore those opportunities. But certainly, I am not the only one who has made such a costly mistake. Even now, many are simply trading away the opportunity to experience the wonder of a deeply fulfilling friendship with the God who created us, and gave Himself for us, and who truly loves us. And, they are doing it only for the very shallow and short-lived pursuits of the here-and-now. Thus, while the opportunity of the ages, further escapes their grasp with each passing day, they invest in the soon to be meaningless corporate climb. They chase hard after the ownership of this life's toys and trinkets. They immerse themselves in entertaining games, and hobbies, at the expense of the most import "game" in town. And, all of this, while they crassly ignore the telling implication of all those end-of-life estate sales they drive past. Nor do they notice the consistent capacity of old age and/ or poor health to prematurily hollow out our material aspirations. Instead, they make themselves momentarily happy with a very low-brow lifestyle of a never ending to-do list involving status, ownership, security, and comfort. Thus, in the not too eventually, they come to their own, sorrowful "too late" end. And, to the person, all who make this mistake will, indeed, cry torrents of fierce tears. 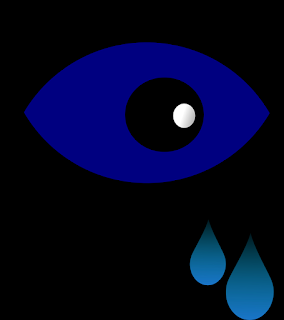 But, in fact, as such tears always are, they will be completely powerless to alter their eternal remorse. But, the tears of too late do not have to be the tears which ultimately define our life and our personal destiny. Better those things should be defined by truly beneficial tears, tears which have the power to make a difference. Better those things should be defined by the joyful tears which mark our humble embrace of the Lordship of Christ. Those things should be marked by the intelligent tears which sets us free from such a short sighted life approach. Indeed, it is the joyful tears of a new, Christ-empowered beginning which truly have the energy to change everything. And, as they bring us to an awareness of the divine truth, and to a vital daily friendship with the Living Christ, and to His elevating guidence - our life begins to unfolds on a whole new plane of awareness. Truly, it is the joyful tears of faith, which bring us to the real opportunity for a deeply fulfilling life. And, it's these very potent tears which also contain the power to entirely rewrite our personal destiny and extend it into forever - in the most fulfilling way. WELCOME! to Reading Room 1. "The Back 40" is a place which attempts to provide a unique perspective on the larger, as well as, the smaller human story. Reading Room 1 is devoted to Essays on a variety of subjects. Reading Room 2 is the Fiction Room devoted to some very Short Stories. Reading Room 3 is devoted to "The First Dimension" - one's spiritual life. The Americana Gallery contains perspective on America's Character and Role in the world. The Milestone Gallery is devoted to various Anecdotes. The Inspiration Room is primarily devoted to Poetry. The Family Gallery introduces the Burnett family. Four call me Dad, and they honor me every time they do. 5 call me Paw Paw. Can that really be? One calls me husband, and has for 49 years. She is my center. One calls me brother. She thinks I'm way better than I am. Hundreds have called me pastor over the last 40 years. Only one calls me son; and she does it with a much more frail voice these days. Some call me "nuts." They have probably captured my essence. Oh, and one will eventually call me home. He is the one I am most interested in pleasing.